Olga de Amaral’s luminous tapestries delight the eye and spark debate about the crossover of art and craft. From the Colombian artist’s point of view, her works are a fusion of several influences, “My everyday life, visual experiences, contact with people, visiting places, architecture, and landscapes.” Made of fiber, paint, gesso and gold leaf, one can see in her works how the limestone of the painted graves in Tierradentro and the megalithic sculptures and petroglyphs in San Augustin have had an impact on her. What stands out are their sculptural appeal and the prominent integration of gold. 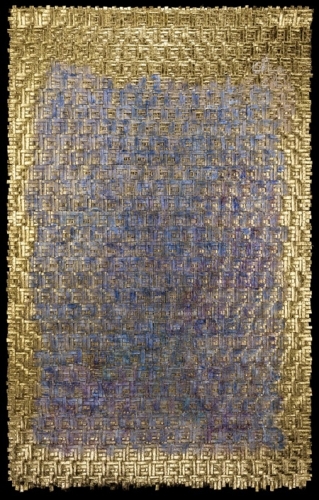 In Amaral’s tapestries gold is a symbol for spirituality rather than wealth or a dialogue on both. As distinct from a history of associating the precious metal with wealth and power in European art, Pre-Colombian use of gold was a reference to the warmth and brightness of the sun as well as immortality. De Amaral's interest in the material was mainly stirred by her visit to Peruvian churches decorated with gold. She also drew inspiration from Yves Klein’s “Monogold” series, and kintsugi, a Japanese ceramic repair method using powdered gold. The most striking works are “Memento azulado” and “Poblado D”. The first is a woven tapestry with a golden surface and a violet-colored square arranged in a manner similar to that of color field painting. The second is made purely of gold that draws our attention through its radiance and varied structured surfaces that provide two opposing effects. Whereas the upper part expresses stillness, the lower part displays a flow of energy.